This guide will show you how to pick the perfect background for your card, edit the card's color, and how to create a custom background. Adding the perfect background to your Inigo digital business card can make the right impression with a new contact. 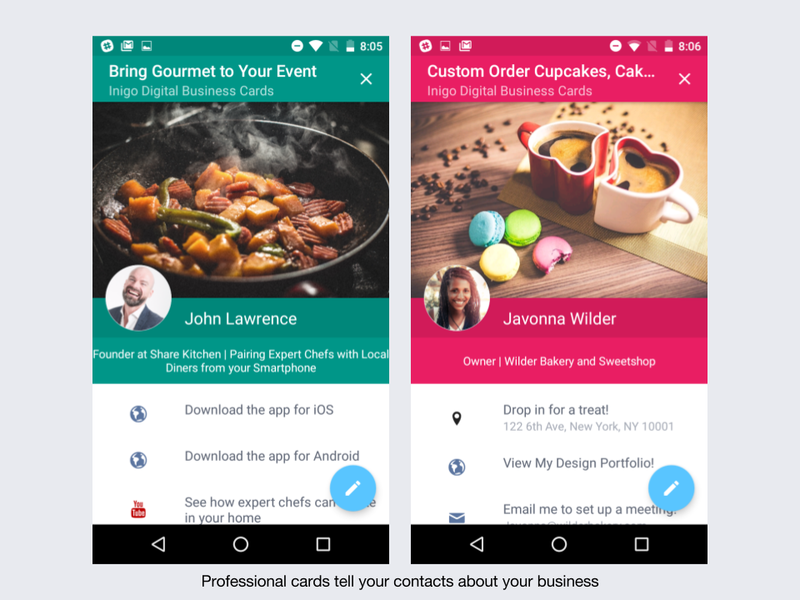 To help you, we’ve added professional themed backgrounds, as well as some fun and personal images to tell your contacts what you’re about! Open the card that you would like to change the background on, and click the blue pencil button in the bottom right-hand corner. This will open the Card Editor page. From here, click "choose background." We have pre-selected some backgrounds that are perfect for certain professional fields. However, some of these backgrounds may be perfect for many fields. If you feel like a backgrounds works for you, use it! Open a folder, and click the image that you want to select. The image will automatically save to your cards background and take you to the card to view it. We’ve added some career specific backgrounds that are perfectly sized for your Inigo card! Choose between financial, real estate, automobile sales, solar energy, music and entertainment, photography, art, and more! Remember, some of these backgrounds may apply to more than one profession. If you think the background is right for you, use it! 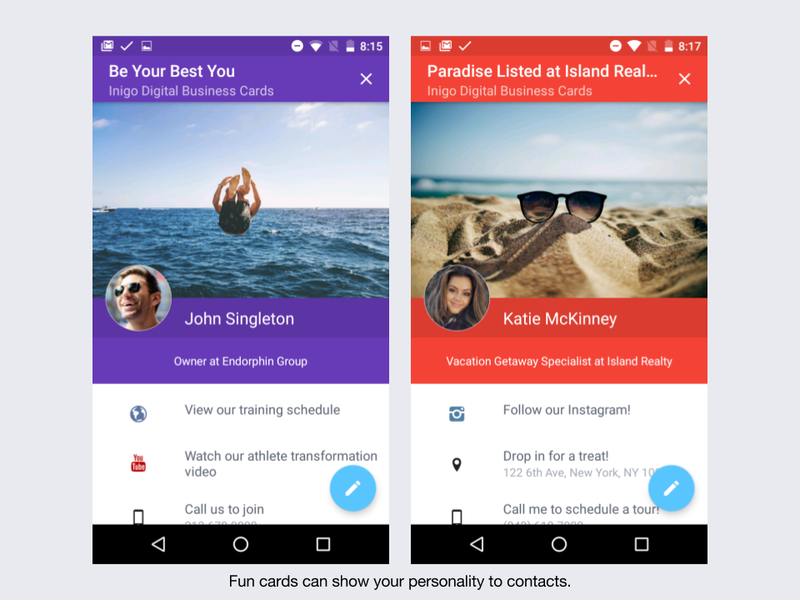 Tell your new contacts that you mean business, but can have fun with these fun backgrounds! Coffee and drinks, beaches, and other feel-good images will add flair to professional cards and tell your personal story. Want to use these for a professional card? You should! A unique image will differentiate you from others. Do you need to add a company specific background? Have you thought about using Inigo Team to create custom templates that can be shared amongst all of your team members? 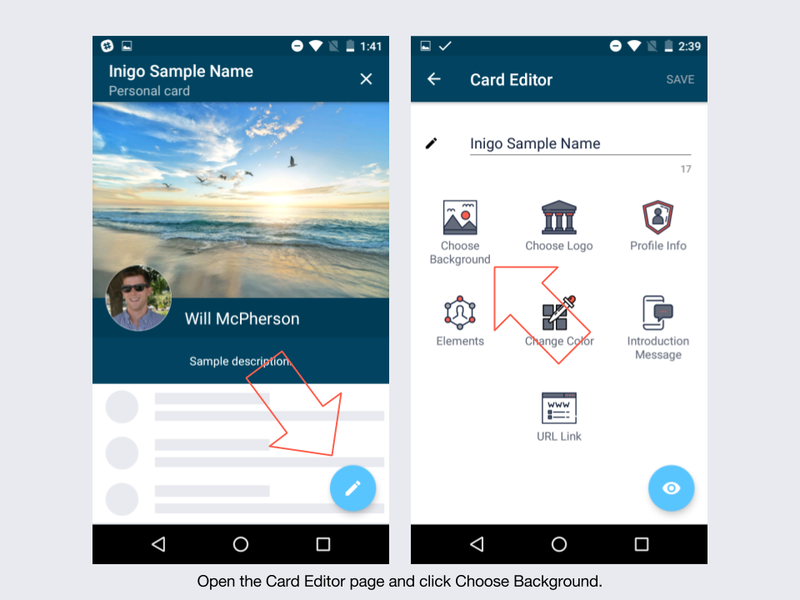 Inigo Team is a great way to create standardized card templates and to add specific elements that can be shared amongst team members. Make sure that you have permission to use this photo if you do not own it. Find a photo that is larger than 1080x720 pixels. If you are using a company image or logo, make sure that it is centered in the image. We used resizeimage.net, but there are many great options! Upload the image and go to resize your image. You do not need to crop the image unless you wish to. You may see several options; make sure you input 100% of the image, and set 1080x720 pixels for the size. Do not select “keep aspect ratio.” This will not allow you to create the right dimensions on most images. Choose “no fill” if you do not want a background color. With this option, your image will take up the entire background. Click resize image & download. Email the downloaded image to yourself or add it to a dropbox that you can access on your phone. You can use Google Drive, Dropbox, iCloud, and many more! Save the image to your phone from this drive file. Open Inigo, and go to Edit > Choose Background > User > Hit the plus button. Choose your image, and it will become your new background image for the selected card. Your new personal background image should be perfectly sized for your Inigo Card! 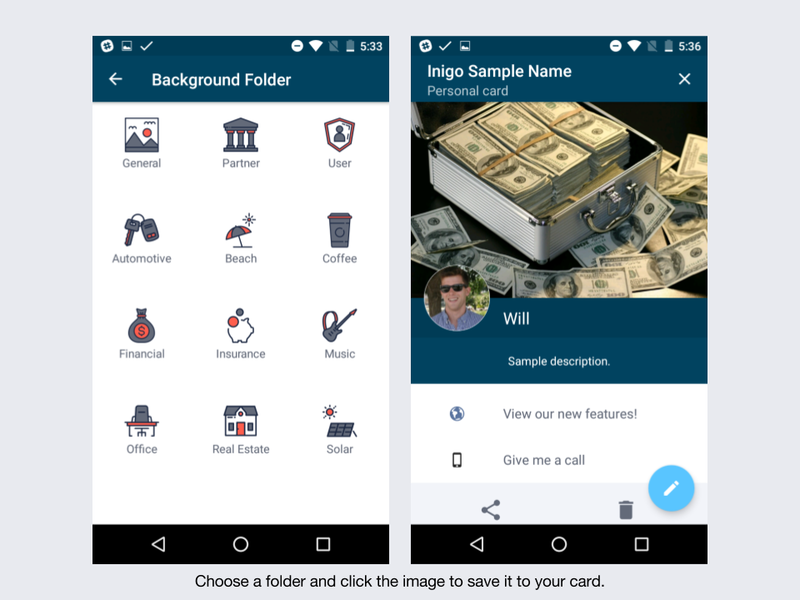 Adding a background image will guarantee that your card gets more notice from clients. Make sure that you put some time into choosing the perfect one, and vary it for all of your cards! You can also customize the color of your Inigo card. Choosing a cool color to compliment your background can make your card look amazing! To change the color of your Inigo card, please go to the main Card Editor page and choose "Change Color." 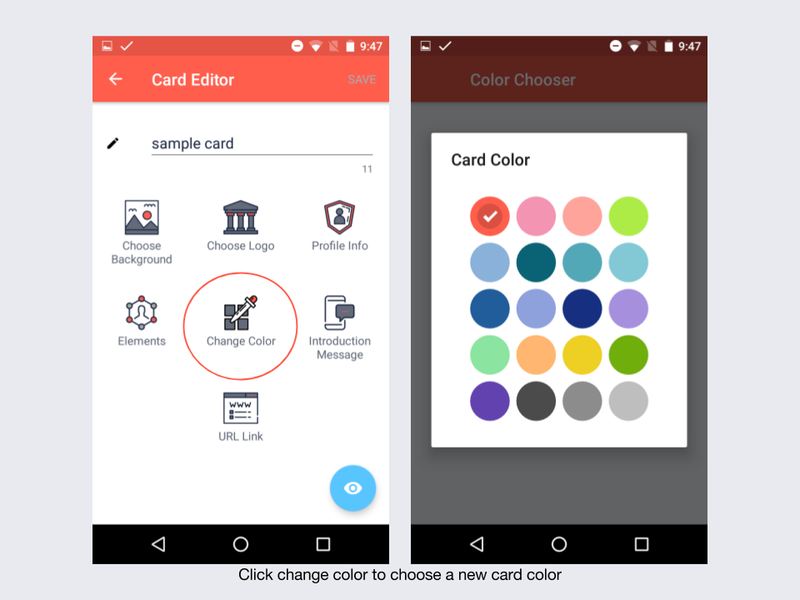 Select a new color and your card will automatically update.